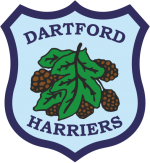 The Club shall be called “Dartford Harriers Athletic Club” – hereinafter referred to as the “Club”. The address of the Club shall be deemed to be the address of the Honorary Secretary. The objective of the Club is the promotion and encouragement of Athletics. The Club shall be affiliated to Associations governing Athletics within the UK. The affairs of the Club shall be managed by an Executive Committee, consisting of the President, Chairman, Honorary Secretary and Honorary Treasurer. As the President’s role is to preside, they may also take on the role of the Treasurer, should the need arise. The Executive Committee may also appoint other Sub-Committees and/or individuals to carry out specific tasks as may be deemed necessary to properly address the affairs of the Club, and shall define their terms of reference. The Executive Committee shall be ex-officio members of all Sub-Committees. The Executive Committee shall meet at least once every six weeks with three to form a quorum. A full Committee meeting of all Club Officers shall be called by the Executive Committee at least once a year. The Executive Committee shall have the power to deal with any matter not provided for in these rules. However, the Club is bound by the rules of UK Athletics. The Club uniform shall be a vest with light and dark blue hoops. The Club emblem shall be a shield embroidered with a sprig of hops. Members are expected to wear a club vest in all events. The Club shall consist of the President, the past Presidents, Life Members, Officers and Members who shall abide by these rules. Honorary Life Membership is awarded to all past Presidents. Honorary Life Membership may be awarded to any Athlete or Administrator who, in the opinion of the majority at an Annual General Meeting deserves recognition of exceptional long and active service in supporting the Club in achieving its objectives. Membership is granted to any club member who gains English or Great Britain team selection in a recognised athletic event for a period decided at the discretion of the Executive Committee. All membership subscriptions shall become payable on 01st April each year. The subscription rate shall be fixed at the Annual General Meeting. Subscriptions are reduced quarterly throughout the year by the discretion of the Membership Secretary. The accounts of the Club shall be made up to the thirty first day of August each year and shall be audited by the Club Auditor nominated at the Annual General Meeting. The Executive Committee may order an examination of the accounts at any time. The funds of the Club shall be vested in the Honorary Treasurer who shall apply and deal with all Club monies in such manner as the Executive Committee shall direct in pursuit of the objectives of the Club. Books of account shall be kept by the Honorary Treasurer and remain the property of the Club. All monies received on behalf of the club shall be handed to the Honorary Treasurer or Membership Secretary. The Club will adopt and apply the “Welfare and Equity Policies” of the national governing body for Athletics in England insofar as it applies to Club affairs. At least fourteen days’ notice shall be given prior to the meeting via the Club website and Clubhouse noticeboards.Resolutions at the Annual General Meeting shall only be carried by a simple majority of those present and voting with, if required, a casting vote by the Chairman. All those eligible to vote must be fully paid up or Honorary members of the Club. The Honorary Secretary upon the instruction of the Executive Committee or upon written request from at least twenty-five members, shall call a Special General Meeting within twenty-one days of such a request. Notice of the meeting shall be as paragraph ten of this Document.Resolutions at Special General Meetings shall only be carried by a simple majority of those present and voting with, if required, a casting vote by the Chairman. All those eligible to vote must be fully paid up or Honorary members of the Club. These rules shall not be altered or amended, except by the vote of two-thirds of the members present and eligible to vote at an Annual General Meeting.